Sturgeon spearing gear and apparel is made and sold locally–take a look at the list below to find spears, gaff hooks, decoys, apparel, and more. Please send an email to winnebagosturgeon@gmail.com if you have something/someone/somewhere to add! Big K Decoys of Big Grass Outfitters, LLC. Colorful hand-made decoys. 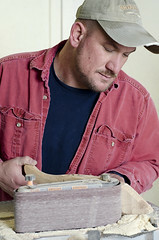 Read more and view Dave’s decoys here. A great place to find used sturgeon spearing equipment such as spears, gaff hooks, and shanties. Hand-carved and decorated colorful decoys. V head, 5 tine, and 6 tine spears for sale as well as gaff hooks. Shirts, sweatshirts, hats, pins, pint glasses, and more during the sturgeon spearing season. Sweatshirts and more during the sturgeon spearing season. A lake sturgeon pin is available, although not listed (also for sale at the High Cliff State Park main office for $4). Sell flying barb spears made by Doug Mader and Phil Verboomen (click here to read more). 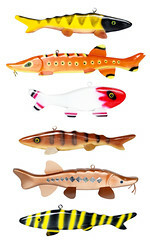 Handcrafted decoys, mini-shanties, spears, birdhouses, gaff hooks, pins, and more. 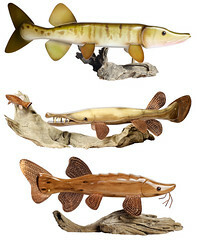 Great Lakes Trophy Fish Rings including Lake Sturgeon rings, pendants, and more.